Growing a contact list from scratch can be a pretty a daunting task. It can feel like you’re constantly testing new call-to-actions to collect email addresses, but it only moves the needle slightly, if at all. You’re regularly maintaining your list, but not seeing significant growth. Shortcuts like buying a list of email addresses can become quite tempting. 3000 new contacts with just one click! Don’t give up just yet, though. 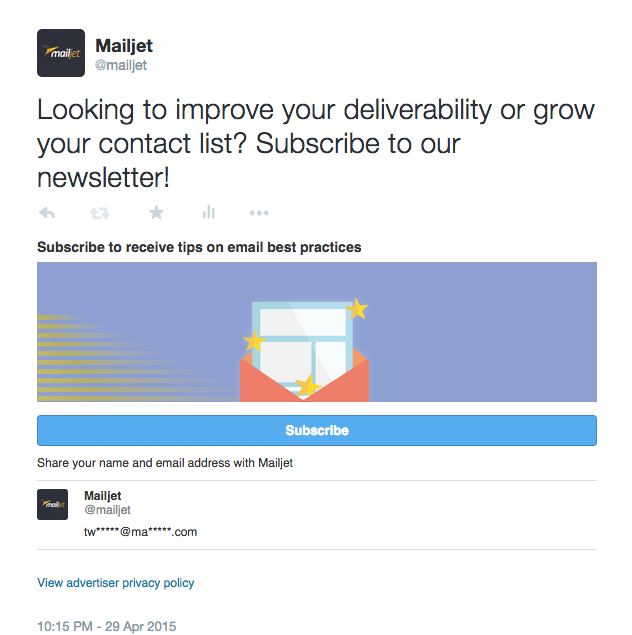 In this week’s Email 101, we’ll be reviewing several ways to grow a contact list organically. Following these best practices upholds your brand and sender reputation, ensures higher engagement and ultimately improves deliverability. Twitter Ads has a series of free cards, the Lead Generation Card being one of them. These cards allow you to easily attach an email sign up box to a regular tweet. We regularly scheduled these cards on our own Twitter account and pin them to the top. You can also use these cards as part of your ad campaign to reach new prospects. 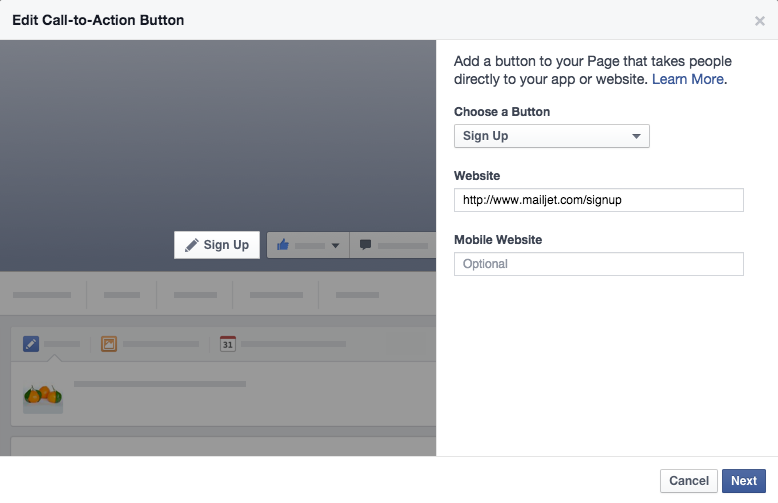 Facebook released a call-to-action function last year that allows you to add a range of buttons to your business page. To set up a “Sign Up” link, simply log in to your account and head to your page. 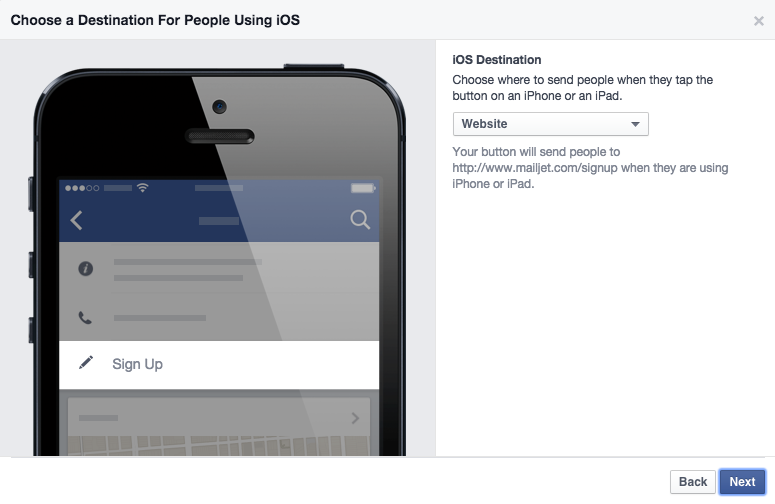 At the bottom right corner of the cover photo, you’ll see a button that says “Create call-to-action”. Since we’ve already done this step, our photo below simply says “Sign Up”. After clicking on “Create call-to-action”, a pop-up screen will appear with more options on customizing your sign up button. The next two screens will then allow you to further define the ‘landing page’ across mobile devices. You will be able to choose whether the button directs a customer back to your site or to a mobile app. And then you’re all set and ready to collect email addresses! At every point of the user experience, you should be keeping email opt-in in mind. 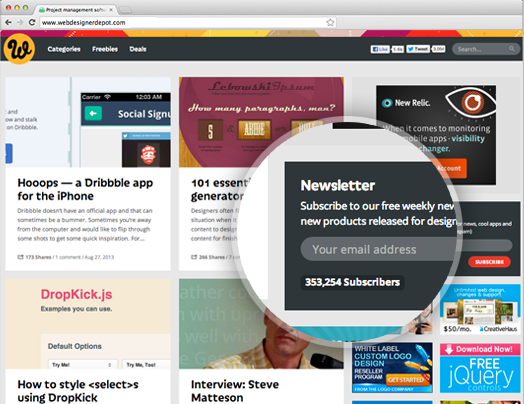 At Mailjet, incorporate widgets into a range of content. We include an opt-in at the bottom of each blog post and make sure white papers, as well as on-demand webinars are through sign-up access only. This helped contribute to the over 100% lift we’ve seen in email sign-ups. Wisestamp is a great tool for sharpening up your personal email signature. It’s a handy tool that allows you to create an email signature template with a headshot, social handles and website. Be sure to try asking your team to add a link to the email opt-in at the bottom of each email. You never know who may be copied in your next external email chain, it can bring in some good exposure especially for sales. This is a strategy a lot of e-commerce businesses typically practice. Drive that first sign up by providing a discount off of the first order. This is especially effective in capturing that wavering customer who wants to purchase a jacket, but it is just a little over budget. Trading an email address for a discount doesn’t seem like too bad an offer. 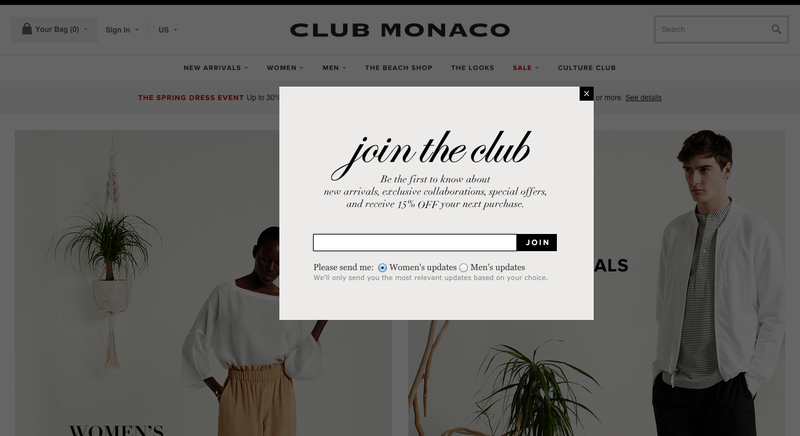 Below is a well designed example from Club Monaco. Despite being a pop-up, the color and font is cohesive with the rest of the homepage experience. Their clean design also makes it fairly easy to sign up. One downside to keep in mind are customers that sign up for the newsletter just for the discount and unsubscribe shortly after. Work to prevent this by keeping your sign ups engaged with a drip welcome campaign. This series of welcome emails shows how your product will continue to add value after that first purchase or action. You can even hand the reigns over to the customer, allowing them to choose what type of content they receive and how often, through an email preference center. This ensures that they will engage at their own convenience. Social proof can have a very strong pull. According to scientific research, FOMO is a very real thing. Fear of Missing Out is a social anxiety that involves being compulsively concerned about missing out on certain experiences and opportunities. And nearly 63% of consumers say that they are more likely to purchase from a site if it has product ratings and reviews. Win over your prospects’ trust by highlighting how many of their peers are already happily receiving your content. Web Designer Depot shows a great application of this, with a subscriber count under the opt-in form. A high subscriber count of 353,254 proves that their content is relevant and adds value. What are some other organic methods have you seen success with? Which of the above will you want to try next?